Drunk driving is always one of the main culprits of road accident and kills thousand of life every year. 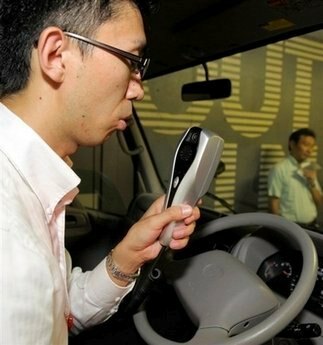 As a measure to prevent and eradicate drunk driving, Toyota Motor and Hino Motor have jointly developed and is currently testing a breath-alcohol ignition-interlock system which potentially reduces tragedies. The breath-alcohol ignition-interlock system features a handheld unit breathalyzer that will detect and estimate the blood alcohol content (BAC) from the breath sample given by the driver and take a photograph of the driver’s face for test-taker identification. The test result will be analyzed immediately and recorded on digital tachograph. Depending on the breath test result on the alcohol consumption, if it is positive and the alcohol level is low and below the danger level, the system will warn and alert the driver. If the alcohol level is high, then the vehicle ignition will be locked. The system can also be used by commercial fleet administrator to monitor their drivers based on their recorded tachograph data. Fleet administrators verify records of breathalyzer checks as part of daily vehicle-operation management. The concept for breath-alcohol ignition-interlock system is not totally new. But if this can be applied commercially, it will help to reduce drunken driving accidents significantly.